Based on available data from genomes and gene expression, it is inferred that 10 Hox genes occurred in the ancestor of arthropods. 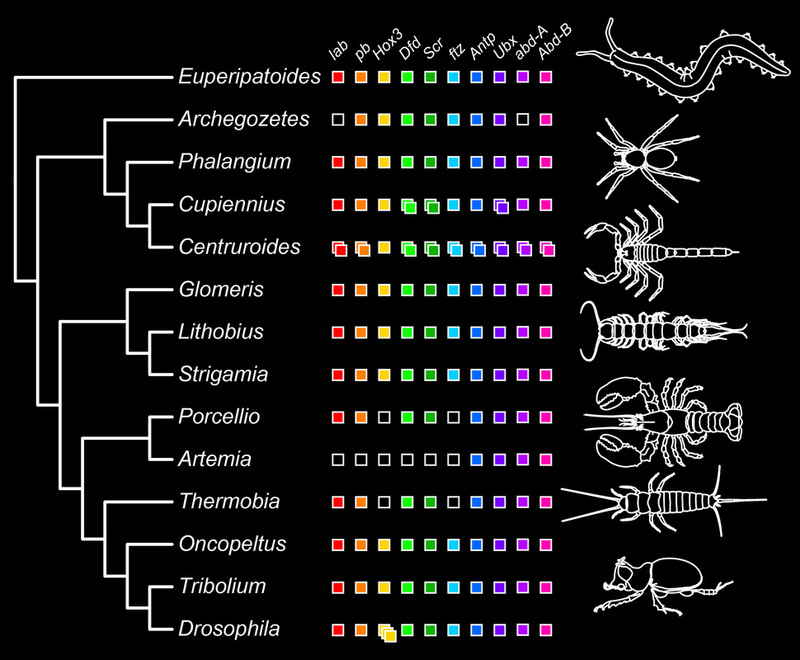 The colored boxes in the figure below represent known gene expression patterns from each of the ten Hox class genes across arthropods and their sister group, the velvet worms (Onychophora). 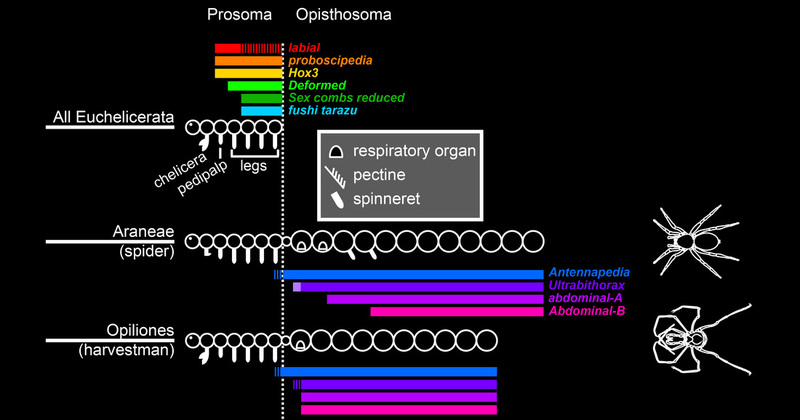 Evolution of Hox gene expression domains is believed to be the genetic mechanism underlying tagmosis, the process whereby adjacent segments evolve in concert to achieve morphological and functional distinction. As an example, insects have evolved three tagmata (head, thorax, and abdomen), whereas centipedes have two (head and trunk). Expression domains of particular Hox genes reflect this transition. Sharma et al. (2014) Proc. R. Soc. B. 281: 20140661. 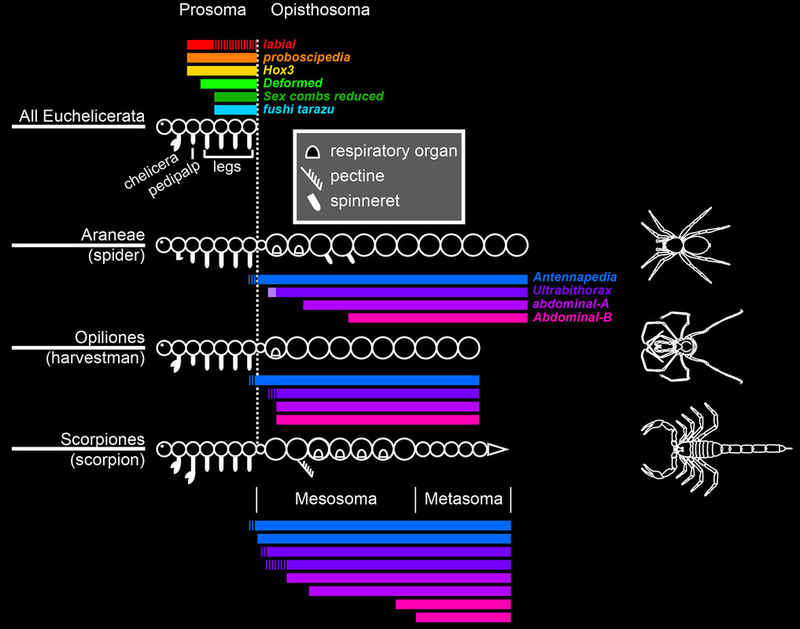 ﻿But under this model, it is not clear how the opisthosoma of a scorpion is patterned. The scorpion opisthosoma is itself divided into two tagma, mesosoma ("abdomen") and metasoma ("tail"), and these have six different segment types between them. ﻿We found that scorpions have not ten, but 19 Hox genes that are expressed during development. Two copies of every Hox gene occur in scorpions except Hox3 (boldface white text in the figure below indicates scorpion sequences). 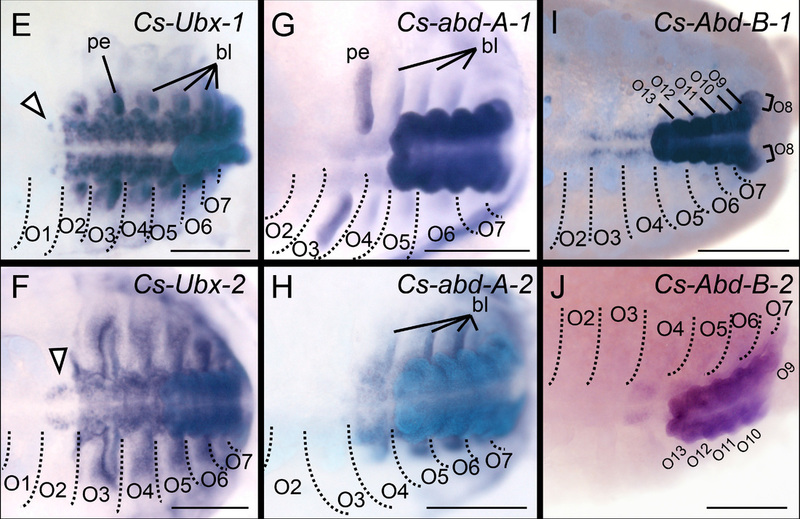 Expression patterns of the last four pairs of Hox genes in scorpion embryos demonstrate unique anterior expression boundaries, and suggest that the scorpion bauplan was achieved by neofunctionalization of Hox gene paralogs. These data reconcile our previous understanding of Hox gene function with the complex segmental architecture of scorpions.